This sticker labeling machine Model SBSL – 120 is regarded as one of the most simple and easy to operate equipment. It is an ideal solution for labeling vials, round bottles, jars, and several other round shaped products. This vertical machine includes the most advanced features such as the micro processor controlled label dispensing system, as well as a sensing system for both labels and products. Further, this tough equipment has the capability to rapidly label up to 120 products in a minute; depending on the diameter of the product and size of the label. It is especially suitable for using labels that are relatively bigger in height as well as in length. You can label a wide range of products made from glass, plastic, aluminum, HDPE, PET, PP, such as bottles utilized for various food products, mineral water, pesticides, pharmaceuticals, etc. The machine also incorporates a positive drive spacing roller for regular shaped containers; that helps to prevent using the star wheel or feed worm in order to uniformly separate the products. Another distinct feature is the vertically and horizontally adjustable pressing device; which enables the users to conveniently align the height and diameter of the containers. 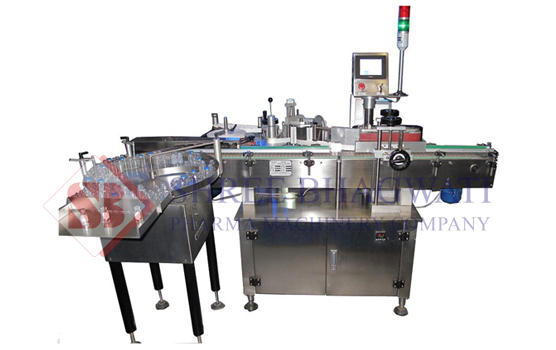 This exceptional model of sticker labeling machine even has its own single point synchronized speed control system. Moreover it also includes an automated system for detecting the length of the labels. Hence there is no need to manual feed and store the information related to the label length into the memory; and retrieve the same every time the user wants to change the label size and restart the equipment. This outstanding characteristic assists in saving a lot of time, and even prevents down time of the machinery, and thereby helps to increase the production. An optional safety cabinet made from acrylic or glass is also available.